The Guitar Collection: George Harrison highlights seven guitars from the former Beatle’s personal collection, with more to be added in future releases of this iPad app. A must-have for hard-core Beatles fans and guitar aficionados, this $10 download also deserves the attention of developers of content-rich iPad apps. It’s fun, informative, and a pleasure to use. The Guitar Collection: George Harrison was produced by Harrison’s son Dhani, who is a musician, and released through Bandwidth. The care taken with the app is evident throughout, with a few exceptions. Guitar Collection provides in-depth information, via text, photos, rotating images, and audio formats about each guitar. This information is both historical (how Harrison came to purchase the guitar, how and when he used it most, custom alterations that were made, and information about each instrument’s manufacturer). 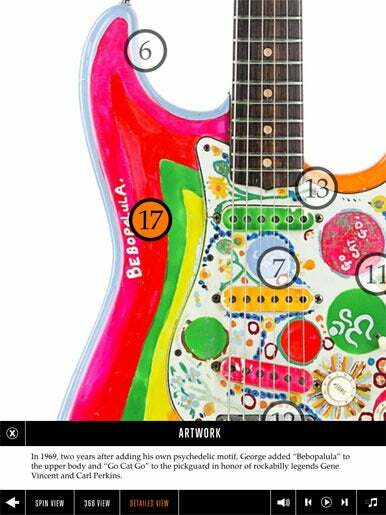 Guitar Hero: The Guitar Collection highlights the instruments in George Harrison’s collection, including this detailed view of Harrison’s Fender ‘Rocky’ Stratocaster, describing the psychedelic paint job applied by George and other aspects of the artwork. In addition, a full-screen view of each guitar in portrait mode enables you to tap different parts of the guitar for more detail on that part. For example, you can discover that Harrison’s Zemaitis Lotus 12-String has a rosewood bridge, solid spruce top, and mahogany neck. The app works both intuitively and flawlessly, automatically linking each guitar to the songs Harrison played it on. If the songs are already on your iPad, you can listen to them in their entirety. If not, you can enjoy a 30-second sample from the iTunes Store (or tap on an unobtrusive link to purchase the song from iTunes). This capability alone puts it a giant step ahead of Rolling Stone’s Beatles Album-by-Album Guide, which described each Beatles song in some detail yet only provided the 30-second iTunes snippets, even if you had the entire tune on you iPad. The Guitar Collection: George Harrison also includes short audio snippets of Harrison talking about five of the guitars, sometimes stunning images of Harrison with each of the guitars, and short videos. The videos are the least interesting element; none include Harrison; the others are of Dhani and accomplished guitarists who have some link with Harrison. Unfortunately, except for the late Gary Moore’s brief commentaries in four of the videos, the others are informal to a fault, with the musicians seemingly seeing the guitars for the first time, often saying “wow,” and subsequently noodling around with one of them for a few minutes. The small number of guitars is also problematic, but Dhani Harrison has said that additional guitars from his father’s will soon be added in free upgrades.